Battery level indicator circuit is a circuit that is used to measure the battery voltage / battery. The main components of the battery level indicator circuit is an LM3914 IC. 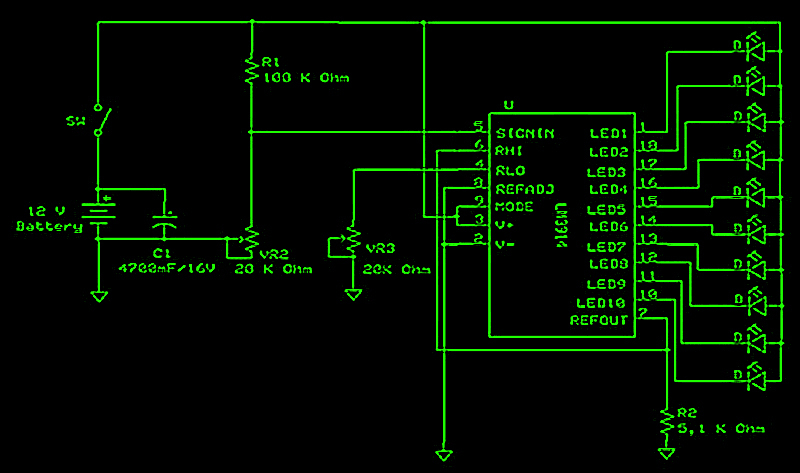 LM 3914 on Circuit battery level indicator is a monolithic IC that detects an analog voltage. And drive the 10 LEDs that produce a linear analog display on a given input voltage. 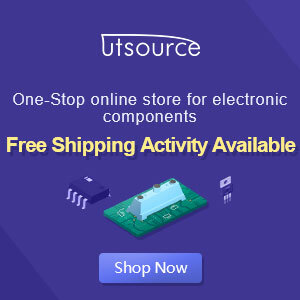 IC LM3914 is easy to get in the market and not expensive. IC LM3914 battery level indicator on the circuit is often encountered in a series of peak indicator audio signals in analog audio equipment. Battery level indicator circuit consists of IC LM3914, 10 pieces of LED, and a few resistors. The scheme of battery level indicator can be seen below. In the circuit of the battery level indicator on the supply circuit voltage taken from the battery / batteries through a switch. 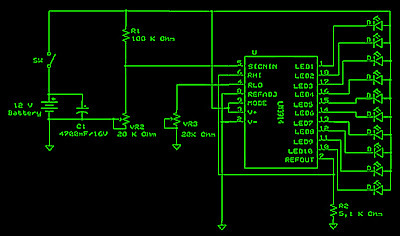 Didesaimn this circuit will only display the battery level when the switch is pressed. This is intended to save the battery voltage itself.